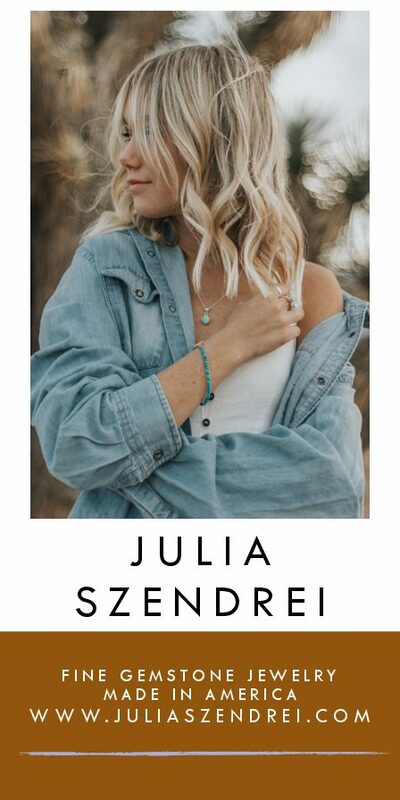 In an industrial building on Bozeman’s north side, the whirl, hiss and occasional groan of hot machinery reverberates over a crackling radio and periodic yells between machinist and engineer at Bozeman Reel Company. The owners of these machines, which could create space-engine components or medical devices, eschew those more serious matters and contribute instead to the art of fly fishing. 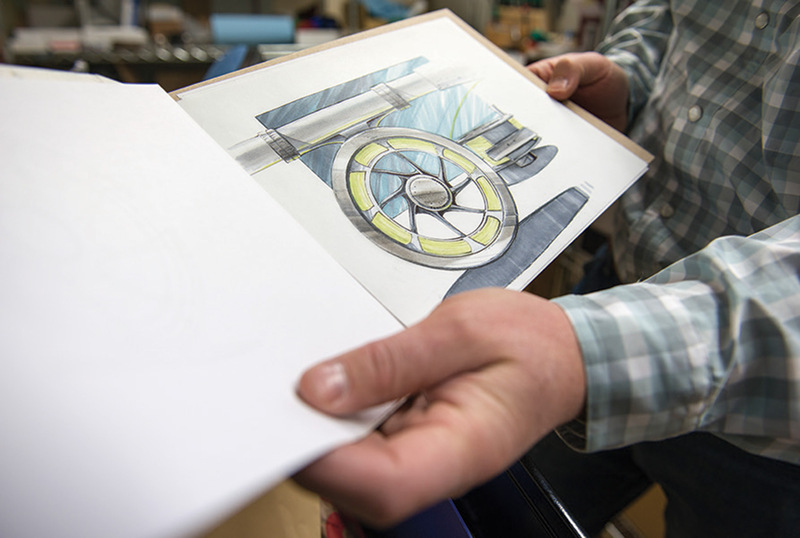 With the technology to manufacture details 10 times smaller than the width of a human hair, Bozeman Reel Company produces about 30 to 50 reels a week from this location, supplying 27 regional and international retailers. It’s a meticulous business, carving a reel from a puck of solid aluminum, and in this churning, technical environment, the muscle of a fly rod is formed. 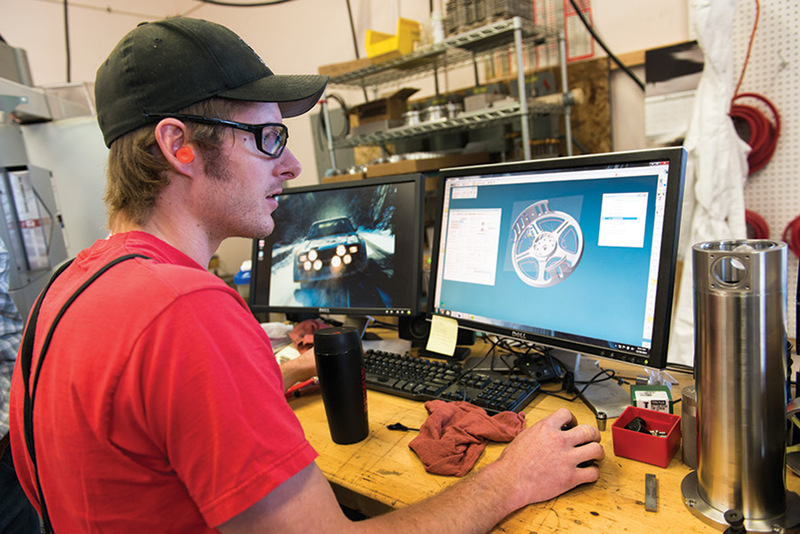 Founded in 2008 by engineer Matt McCune (who owns the partnering machine shop), the company’s philosophy combines a scientific approach with a Montana ethos: a handshake is as good as your word and there’s value in doing things right the first time. 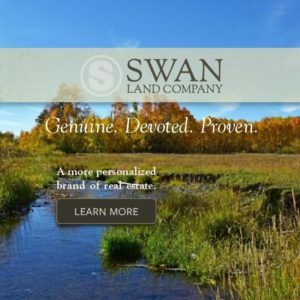 With a new owner and the goal to quadruple sales in 2015, the company’s ambitious plan for the future entails releasing two new reels this spring, and further developing and marketing their accessories, fly-tying materials and rods. Rice, who formerly worked in the aerospace industry in Milwaukee, grew up fishing for muskie and smallmouth bass with his parents and grandmother. His passion for his product stems from those treasured hours spent on the water. 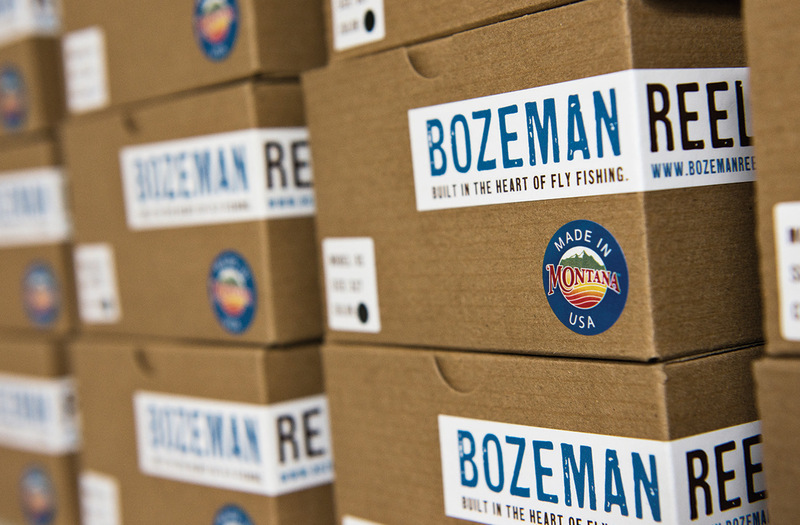 Designed and developed in “the heart of fly fishing country,” Bozeman Reel produces two series of reels that local guides have tested as part of the research and development phase in both nearby rivers and places as distant as the Indian Ocean. Light, but durable and reliable, the River Stream series has an inventive drag system that manages start-up inertia, and was designed with strength and precision in mind. The Stream Creek, or S-Handle Classic, is “more of a classic art piece,” says Rice. Inspired by the 19th-century designs of Edward vom Hofe, whose reels are considered among the best ever made, these reels recall the era of wicker creels and are built with a click-pawl drag system that allows line to leave at a steady pace. “People are going to use the [Stream Creek] on a bamboo rod or fiberglass rod — someone who is a little bit puritan,” he says. 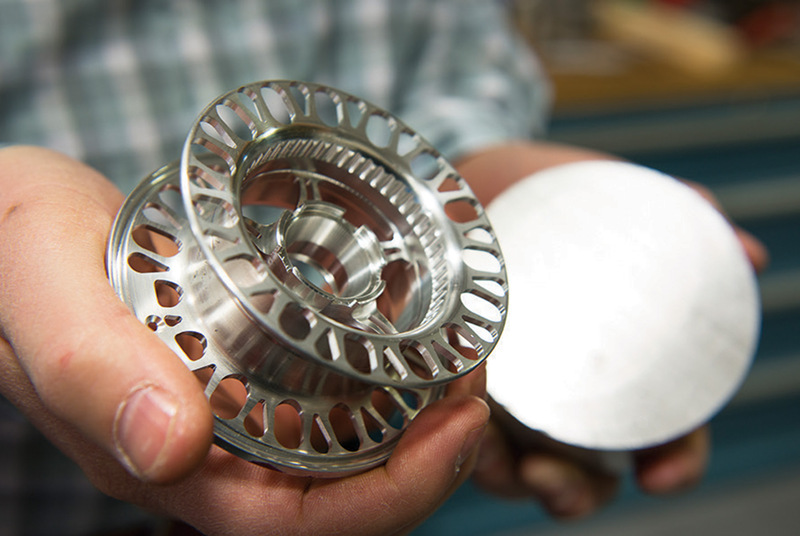 A majority of the reel components are machined in Bozeman. 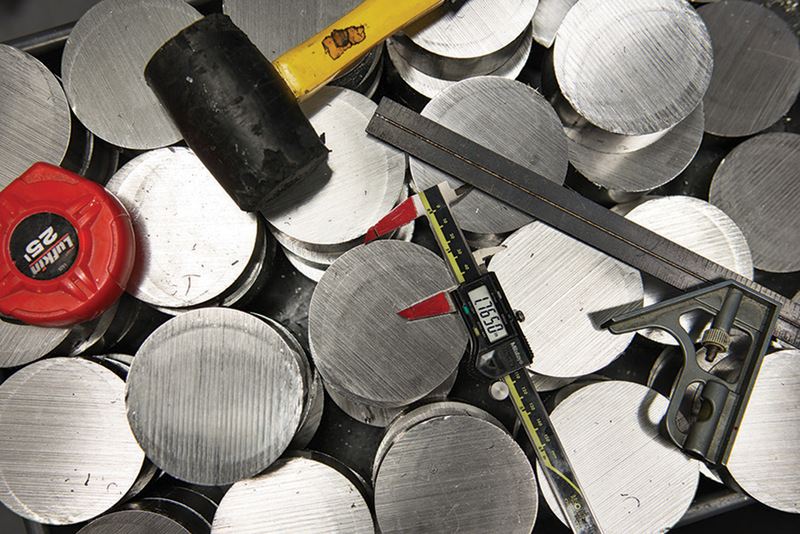 The process starts with heavy bars of aerospace-grade aluminum that are sliced into one-pound pucks. About 95 percent of the puck will be removed as negative space. The puck is first shaped in a lathe and is then transferred to a machine awash in engine coolant, where a new set of tools whittle away more aluminum. 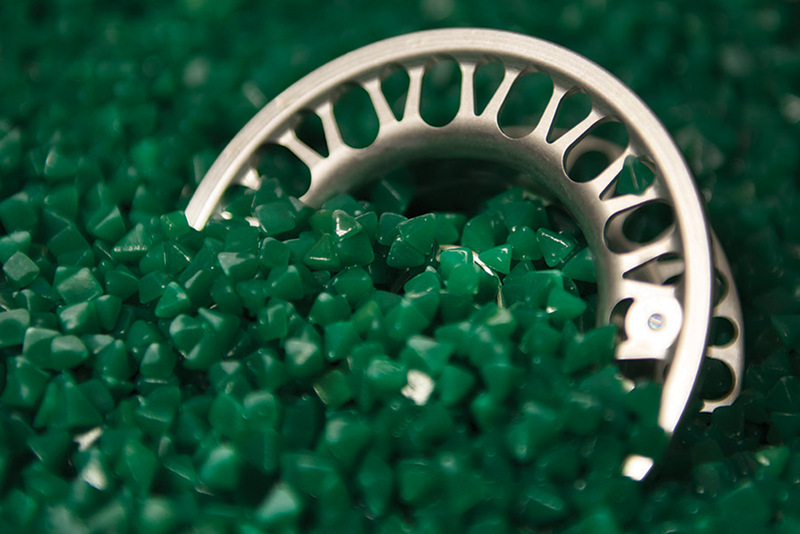 The reels are then tumbled — two at a time — in a vat of triangular-shaped porcelain beads for a smooth, matte finish. Any additional imperfections are removed by hand. After this process, the reel pieces are boxed and shipped for anodizing. In this stage, they are cleaned and chemically etched to remove a thin layer of metal. Once dry, these parts are dipped into an anodizing tank, where electrical currents are used to build a protective coating that prevents rust and scratches. If the reels are to be colored, blue, pink, black or other dyes are applied during this phase. The reel parts are then shipped back to Bozeman for assembly. Composed of 30 pieces, this process takes about two hours and each component — the counter weights, spool knots, drag discs, clickers and drag knobs — are puzzled together by hand. Finally, the company logo and “Made in Montana” are laser-engraved into place. “You think about the complexity and it’s pretty fascinating that every little part has been thought out,” Rice says, explaining that everything from the edges, to the knurling, to the finger grips on the drag knob were scrupulously designed. It’s a logical fit to create such a reel in Bozeman. There are few places more revered in the minds of fly fishers than Montana. The sound of a spinning reel as a fish runs is one that every angler anticipates and is more warmly welcomed than the whirling throb of machinery, but the art of fly fishing must begin with the fine art of craftsmanship. Starting as a single piece of aluminum, Bozeman Reels are meticulously machined to precise tolerances. 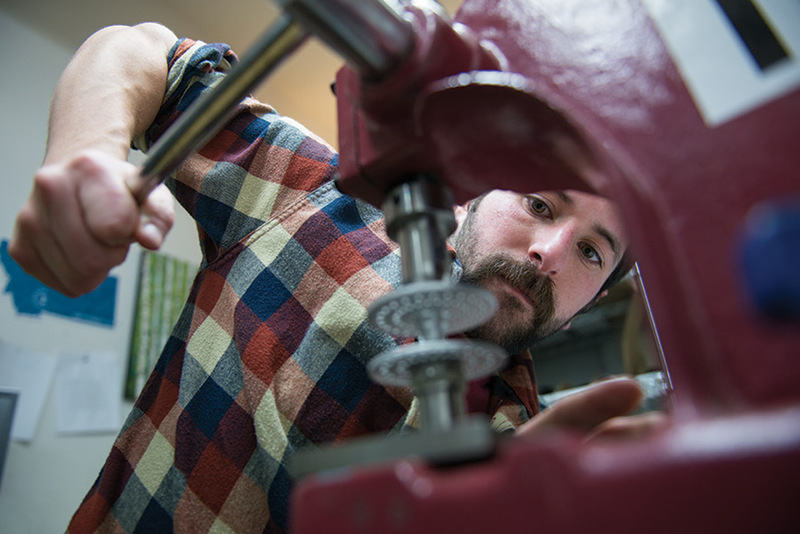 Chris Stroili uses a hand press to insert a part on a S-Handle Classic spool. An RS Series Bozeman Reel is tumbled with porcelain media to eliminate sharp edges and provide a matte finish. Richie Leibscher works with a computer aided drafting model of the Bozeman Reel. Dan Rice displays an early concept drawing of the Bozeman Reel. 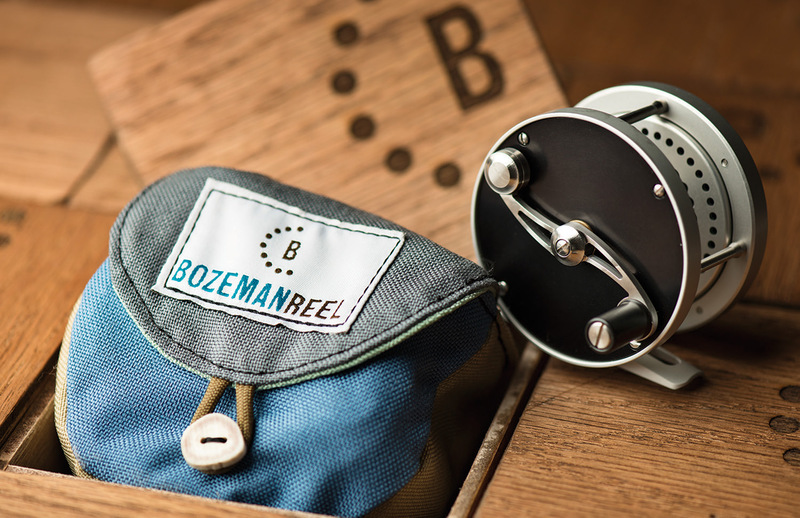 Each SC Series Bozeman Reel is presented in a wooden box and comes with a handcrafted case made from recycled material from a Bozeman gear company. 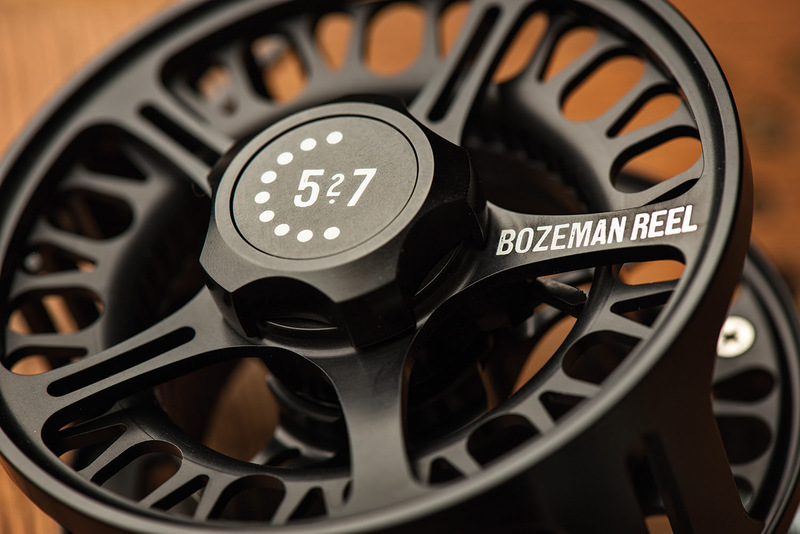 The RS Series reel is manufactured at Bozeman Reel in the heart of fly fishing country. 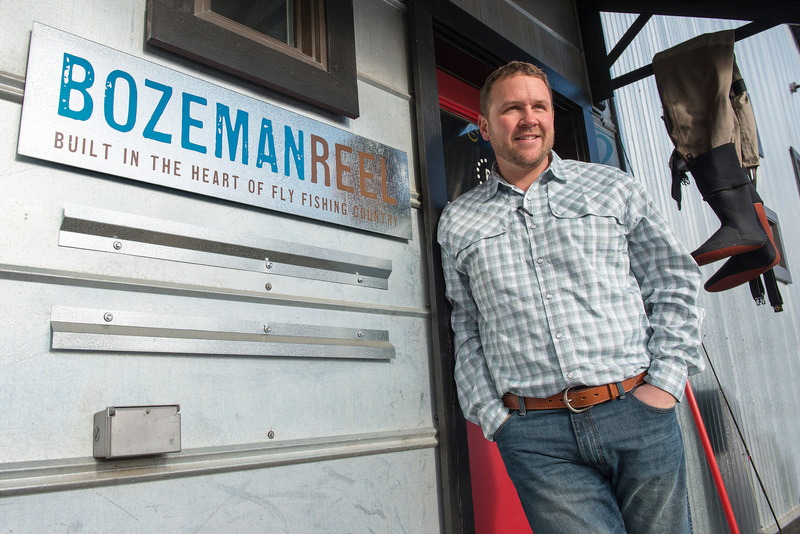 Dan Rice, owner of Bozeman Reel, stands outside the production facility in Bozeman, Montana. 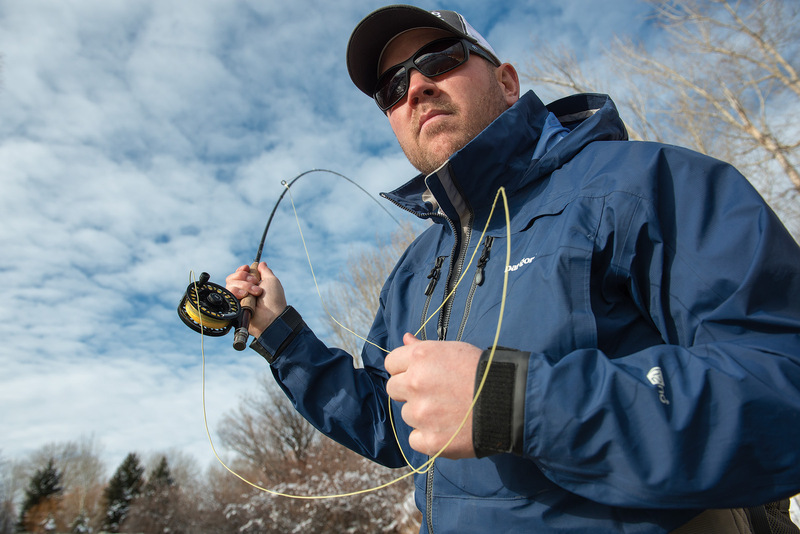 Dan Rice fishes an RS Series reel on a small stream near Bozeman Reel headquarters. Made In Montana: RS Series reels await delivery at Bozeman Reel.